The two biggest expenses are fuel and where you’re staying. You can make a significant impact on your monthly budget just looking at those expenses. Let’s be honest. At one time or another we’ve all dreamed of renting an RV (Recreation Vehicle), traveling around the country, and visiting all those bucket-list destinations with unbridled freedom knowing that everywhere is home. More often than not the fantasy dissipates, and we return to a “normal, structured life.” But for millions of Americans, the fantasy lives on in the form of fulfilling a lifelong dream upon retirement, or a new generation of consumers who want to live less expensively while staying connected to the world via mobile technology. Either way, the trend is growing, and Marc and Julie Bennett are at the forefront of understanding how to maximize the experience. ExpertFlyer.com caught up with the Bennett’s in their RV while in the Florida Keys. Since 2014, they have been full-time RVers, enjoying the open road and sharing their adventures with others through their blog, RVLove.com and a new book titled, Living the RV Life: Your Ultimate Guide to Life on the Road. Listen to the full podcast interview on ExpertFlyer’s blog. Spending long periods of time in an RV can have its drawbacks. Being confined to a smaller space, and on the road, means you may not have that “quiet space” you were accustomed to with a house. “Squeezing your whole lifestyle into a smaller space can bring up things that weren’t topics of discussion before. But it also provides a great opportunity to communicate better with family members,” added Marc Bennett. It also helps to be handy with tools since something always seems to need some fixing on an RV. Whether it’s loose bolts, rattling cupboards, or a broken something, keeping a few basic tools on board is a must. As is the willingness to have a go at DIY-ing many other repairs. In addition to insights from Marc and Julie Bennett, ExpertFlyer spoke with Marianne Edwards, a full-time RVer who shared “8 Money-Saving Tips for Nomadic Living” in the blog’s ongoing Hot Topics series. Ms. Edwards runs Boondockers Welcome, a site that connects RVers with people across the country who are open to letting them stay on their property for free. Visit ExpertFlyer’s blog to listen to the podcast with Marc and Julie Bennett and learn more about cost-saving tips for RVers from Marianne Edwards. Marc and Julie Bennett live, work and travel from their RV full-time and are best known as “RVLove" sharing their adventures and learnings on their website, YouTube and social media. Since hitting the road in 2014, they have visited all 50 USA states (48 in their RV), plus Canada, Mexico and Australia and also appeared in the movie "RV Nomads”. They are passionate about inspiring and educating others to help them learn how they, too, can live and love the RV life through the content they share on their website RVLove.com, YouTube videos, online courses at RVSuccessSchool.com and in their bestselling new book “Living the RV Life – Your Ultimate Guide to Life on the Road” (Adams Media/Simon and Schuster). 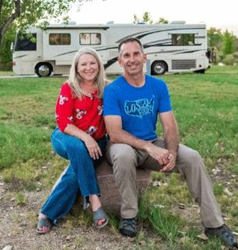 Marc and Julie are known for their honesty, inspiration and positive attitudes about RVing as they share the realities of the ups and downs of life on the road. You can find the Bennetts at http://www.RVLove.com and connect with them on social media as @RVLoveTravel. Boondockers Welcome is built by RVers, for RVers. Their philosophy is that RVing brings out the best in people - being in new places, while sharing tight quarters next to complete strangers every day has a way of making people learn what is important in life and how making friends on the road is often the best part of the story. By definition, RVers love to travel, and want to do so comfortably and affordably. They know firsthand that RVers will welcome each other to stay on their property only moments after having just met. Kindness and generosity abound. Boondockers Welcome is a venue where RVers can connect and welcome each other to camp on their property, with no expectations of being paid in anything more than gratitude and a pay-it-forward spirit. Each month, ExpertFlyer's One-on-One blog goes face-to-face with the travel industry's leading decision makers to discuss and address topics relevant to many of today's business and frequent travelers.